Home BLOG History of Psychology and Medicine Review: The Expressiveness of the Body and the Divergence of Greek and Chinese Medicine. First of all this is a beautiful book. One does not often say that about academic paperbacks, but this book – from cover art to type face to book design – communicates that same care and effort that is evident also in the writing. This is a scholarly work, well researched and documented, which presents a wealth of information and understanding in a succinct and distilled manner. 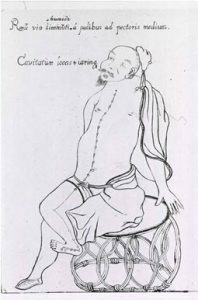 In conjunction with this idea he presents illustrations like the two below, demonstrating the significant difference between the ways eastern and western medicine has historically viewed the human body. The differences in these images reflects a difference in ways of seeing between the two cultures – not a more advanced way of seeing in one culture and a less advanced way in another. To illustrate his thesis, Dr. Kuriyama divides his book into three sections, each of which looks at a particular feature of the body and its functioning from the eastern point of view and from the western point of view. The first of these sections is called Styles of Touching and follows the development of pulse-taking in eastern and western culture. For two thousand years, in China, in Europe, and elsewhere too, people queried the pulse with passionate interest. In principle, Chinese doctors recognized four ways to judge a person’s condition – gazing (wang), listening and smelling (wen), questioning (wen), and touching (qie). In practice, however, their attentions concentrated mainly on qiemo, palpating the mo…. We find a similar enthusiasm in Western medicine. In antiquity, the Greek physician Galen composed seven extended treatises on the pulse, filling nearly a thousand pages of his collected works. Hercules Saxonia declared that “Nothing is or ever will be more significant in medical science.” Benjamin Rush reasoned for his part that if admission into Plato’s Temple of Philosophy required mastery of geometry, the gates to a Temple of Medicine should bear the inscription “Let no one enter here who is not acquainted with the pulse.” Even in 1878 an American doctor could still pronounce pulsetaking “the most valuable of all devices to which a physician can resort,” and think himself echoing the “unanimous voice” of his colleagues. (Kuriyama, p. 19-20). What happened to change the view of pulse in the West into a mere reflection of the beat of the mechanical heart pump? Why in the East did pulse maintain its importance and became more refined and subtle as a reflection of the state of many bodily functions? Dr. Kuriyama has some very interesting answers to these questions. The second section deals with Styles of Seeing, which looks at how the two cultures view the body (reflected in the two images above) and addresses the question: What differences in cultural attitudes lead to these views of the body? 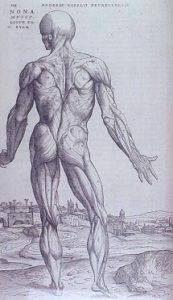 The final section concerns itself with Styles of Being and contrasts the importance of blood and wind in the two cultures. This book is fascinating if you are interested in the history of medicine, alternative ways of healing, or medical anthropology. To me the joy in this book is that it is well written; talks down to no one – not the subject and not the reader – and presents information that requires the reader to examine her own views and cultural biases. There is a great deal of food for thought in this work about culture and paradigms and why we see the world the way we do. This is a message that goes far beyond the subject matter of Western versus Eastern medicine and informs our views of culture and epistemology. 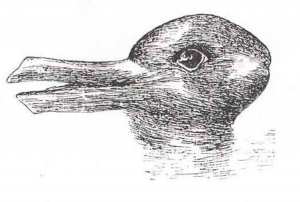 1Interestingly, this drawing appears in the beginning of another book I am currently reading (Looking Glass Universe: The Emerging Science of Wholeness, by science writer John Briggs and physicist F. David Peat. An interesting synchronicity! Both books address the idea that how we look at the world depends on what we are looking for… and how the paradigm in place in our culture determines how we think and what we see.